We hear the refrain ‘We are still too small to need CRM’ very often. Spreadsheets as a tool for tracking Opportunities, Customers, Invoices & Payments was fine when the business started and the founders were the only members of the sales team. Fortunately your business has grown, but so have the problems. Most of these problems are due to the increase in the number of Customers as well as the Sales team. Spreadsheets are no longer enough for a variety of reasons. The key being that the data is getting too large and important and you cannot afford to lose it. Besides the need to manage data that is getting larger due to the higher number of transactions, you realize that you need to automate as well as collaborate if you don’t want to be a scrappy business forever. To take the leap from being a scrappy business and becoming an emerging business, you will do well to pay heed to some tell-tale signs. You don’t know the most effective lead sources as well as the most profitable customers, segments & products. You cannot grow profitably if you are unable to find answers to these readily and act upon them. The right CRM software will help you identify Gross Margins for each customer, sale, segment & product, so that you can start focusing your efforts on the most profitable ones. Even if you know the pipeline like the back of your hand, to achieve the annual goal you need to know the forecast revenue at any given time. For this it is important that you are clear about the stage of each opportunity, the probability at that stage and the amount as quoted to the customer. Together these three will give you the estimated forecast amount. Moreover the stage of each opportunity helps you identify the forecast closure date. Together these two tell you the estimated revenue in the current financial year. A well managed profitably growing business should not have to worry about cash flow. If you are still struggling, the key reasons could be that either you are not raising invoices on time or not tracking overdue invoices. You need a CRM software that makes generating an Invoice and tracking payments a breeze. There could be other reasons like delay or quality of delivery. Unless you are bootstrapping, you can expect about 30-40% of your time will be spent in talking to investors. Whether you want to raise funds from angel investors, VCs or take an exit in the form of acquisition or IPO, you need to have the data available for pitches as well as due diligence at all times. In due diligence, you will have to provide data sliced whichever way you are asked e.g. top 10 customers, top 10 POs for the last 3 years etc. This can only happen if your data is stored in a single database that only a CRM integrated with ERP can provide. 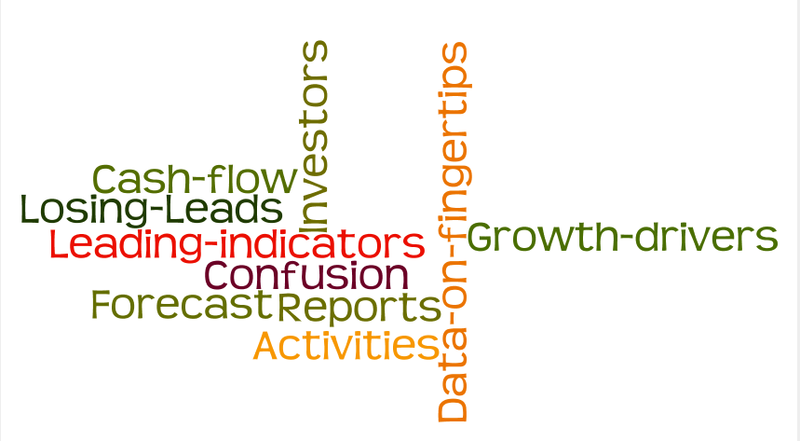 While revenues & profits are outcomes, to achieve your targets you need to keep an eye on leading indicators like leads, opportunities & activities. You also need to keep an eye out for their conversion rates. You struggle with spreadsheets, their versions, formats & data across sales persons as well as across review periods. Currently you either create no reports at all, or doing this is very cumbersome for your sales team. Your customer information is available on spreadsheets and papers. Updated information is not available, information gets lost regularly, and your team members do not have visibility into each other’s contacts. If your customer data is not stored in a secure database on cloud, you are limiting your view of how your customer interacts with your team and business. It is tough enough to attract customers and have them register on your site. So tough, that you simply cannot afford to lose the leads. Yet only a handful gets converted and you have no idea what happened to the rest. Since your sales executives are busy in the field, the new data gets stored on paper or files on laptops. You need to have a fast and easy way to store the information securely and share it with your entire team instantly. The problem is made worse when the sales person handling the leads leaves the company and you are left without the vital information that he had been carrying in his head. You lack visibility into what the sales executives are doing, especially the Next Steps for each opportunity so that someone can guide them. The lack of visibility also results in mis-managed activities, something that you cannot afford in front of the customers e.g. Sales person sending unapproved quote with terms & conditions that cannot be honored. You have multiple team members contacting customers without access to what the others have communicated. This confuses the customers. With the right CRM your team members across departments will have access to all interactions with customers. This results in the customer feeling highly valued as everyone seems to be aware of all their transactions. If many of these signs apply to your business, don’t despair. These indicate that you need a good CRM as these are exactly the pain points that a CRM software addresses. It helps you track Leads, Contacts, Opportunities, Activities, Quotes, Orders, Invoices, Payments, Inventory, Gross Margin & Taxes. Besides helping you track all the sales related transactions, a good CRM also provides your team a social media like collaboration environment. Only a team that can collaborate effectively can work together and achieve the business goals. If you still think you are too small for a CRM and do not pay heed to the above signs, then it is likely that you will stay small. The final argument for using CRM can be made by borrowing from the famous Henry ford quote “When business is good it pays to use CRM; when it is bad you have got to use CRM”.